It's always comforting to know that I can do a lot of important things inside the Linux terminal. Even those stuff that I normally do using a GUI like posting Twitter updates, downloading torrent files and Instant Messaging (IM). 2. After having successfully installed youtube-dl, open a web browser and go to youtube.com to pick a video that you would like to download. 3. Copy the page URL/address of the Youtube video. You can add the -b option to download the video in high quality, e.g. 5. The downloaded video will be saved at /home/username by default. It will be in .flv format so be sure to have flash plugin installed before viewing the video. I didn't know that this handy python script is shipped as a package. 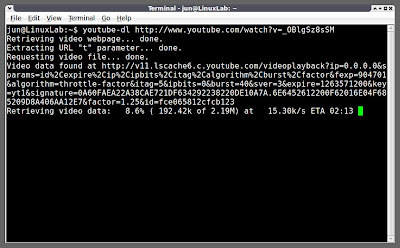 I usually use firebug to fetch the video url or just look through the source code and use wget to grab the video. Interesting to know there's a package that does all that automatically. Like mmlosh said, you don't really need flash to play that. mplayer works fine. Or you could use ffmpeg to convert the vids to your favorite format. Am I the only one who lets the video stream in the browser and then take the corresponding temporary file from the /tmp directory? An alternative is 'clive' which, should you want it also has a GUI. reply from terminal: Error couldn't download video format may be unavailable. it is wriiten there. the format maybe unavailable. What should I do? hi after giving the first command it asked for password? "ERROR: unable to download video webpage: HTTP Error 404: Not Found on ubuntu "